ABKO/NCORE is going to participate to the Electronics Trade Show 2017 which will be held in the Hongkong Asia World Expo from Oct 11st to Oct 14th. - ABKO has been expanding their business field to Global ICT company as well as designated as the promising company for export in 2016 from the Small and Medium Business Administration in Seoul. 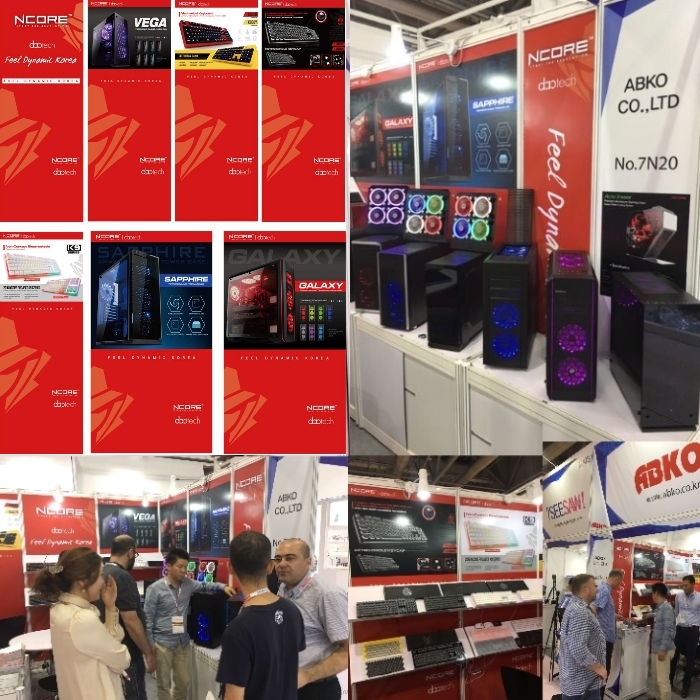 The ABKO/NCORE participated to the last Electronics fair in Hongkong on the last Oct, 2016 and attracted many buyers with big interest on various of PC case, Cooling fan, Keyboard, Mouse, Headset and also, on the system of Tablet Tower, Mobile Tower and Padbank which offer synchronization for ios, android, 3 kinds of window OS. And as the result of active overseas sales action and get recognized visibly, ABKO designated as the promising company for export in 2016 from the Small and Medium Business Administration in Seoul. For this Hongkong electronics fair in 2017, ABKO will attend the fair in the booth # 10P02 and they are planning to spread their fame & brand widely to the whole world market, presenting their various products that has been mainly selling in their local market and to be newly released products.